Conspicuous for its habit of forming large flocks to roost, this species has adapted well to life in towns and cities. It breeds in loose colonies, in which the males defend their nests fiercely. Feeding flocks probe the ground with sharp bills for worms and insects. • NEST A cup nest in a tree hole, among rocks, or inside a building or nest box. • Distribution From Europe and N. Africa east as far as W. China and India. Introduced in North America, distribution South Africa, and S. Australia. I his stocky, white bird owes its rather heavy- cresl headed appearance to a crown of long feathers. In courtship, the male raises these feathers and performs a head-bobbing display. The species is sociable, forming flocks except when breeding. Birds forage in the trees for fruit and insects. • REMARK Due to the destruction of its habitat, the wild population is almost extinct. 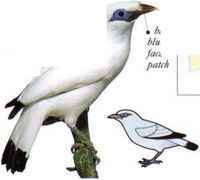 Attempts are being made to save it by aviary breeding. I" locks of this sociable, noisy species often travel nomadic-ally through open woodland or along the galleries of tall trees beside tropical rivers, searching for ripe fruit and insects in the upper foliage. 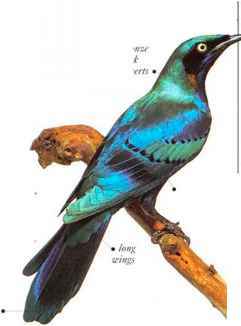 The Splendid Glossy Starling is particularly fond of wild figs, anil a fruiting fig tree may attract large numbers of feeding birds. Being up in the tree canopy for so much of the time, the species is difficult to spot, but when flying between trees it can often be recognized by its distinctive, hunched posture. Its beating wings make a noticeable swishing sound. Calls include shrill whistles, rasping sounds, anil deep throaty noises. 'These are heard particularly in the evening as the birds gather in their hundreds to roost.